[173 Pages Report] The global incident response market size was USD 11.05 billion in 2017 and is projected to reach USD 33.76 billion by 2023, growing at a Compound Annual Growth Rate (CAGR) of 20.3% during the forecast period. The base year for the study is 2017 and the forecast period is 2018–2023. Incident response refers to a predefined and an organized set of procedures and approaches that need to be followed in the event of cyber-attacks, which are sometimes known as cyber incidents, security incidents, and Information Technology (IT) incidents. The various incident response solutions include capabilities such as case management, orchestration, automation, and intelligence into a single platform and assist security teams assess, measure, and improve these capabilities. Organizations use incident response solutions to monitor networks and endpoints for the advanced intrusions and fraudulent activities. Governments and the security agencies, which include regulatory bodies across various geographies are conscious about the protection of the sensitive data of their citizens and organizations against any cyber threats. The continuously evolving cyber threats have given rise to a large number of government regulations globally that are needed to be strictly adhered to, by all organizations. Organizations are compelled to meet the mandatory security standards, failing which a heavy amount of fine is to be paid to the government and regulatory bodies. For instance, PCI DSS clearly states requirements, which are expected to be followed by any company during, before, and after an incident. Similarly, the HIPAA compliance mandates organizations to maintain the integrity of the patient’s health information, failing to which they are charged with heavy fines. Moreover, other compliances, such as EU GDPR, SOX, GLBA, FISMA, and NERC-CIP, also regulate various verticals to maintain the data integrity and encourages organizations to adopt the best cybersecurity practices. This regulation of data is done by maintaining incident response teams that are capable of handling and identifying breaches and any security incidents. Organizations are bound to develop the incident response plans and policies, which should be reviewed and approved by the management, annually. To define, describe, and forecast the incident response market by component, security type, deployment mode, organization size, vertical, and region. To provide detailed information regarding the major factors (drivers, restraints, opportunities, and challenges) influencing the growth of the market. To analyze the micromarkets1 with respect to individual growth trends, prospects, and contributions to the total market. 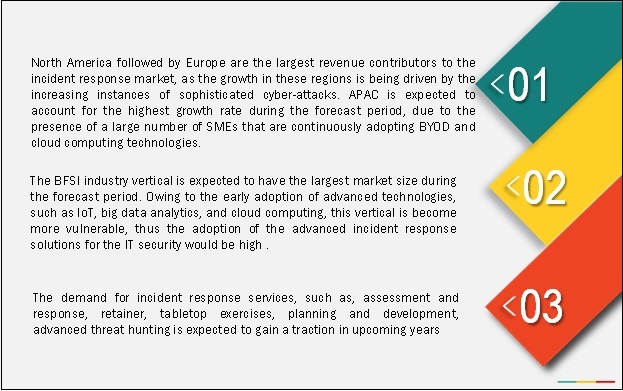 To analyze opportunities in the market for stakeholders by identifying high-growth segments of the incident response market. To profile the key players of the global market and comprehensively analyze their market size and core competencies in the market. To track and analyze competitive developments, such as new product launches; mergers and acquisitions; and partnerships, agreements, and collaborations in the global market. The global incident response market comprises key vendors, such as Symantec (US), McAfee (US), Palo Alto Networks (US), FireEye (US), IBM (US), Cisco (US), Check Point Software Technologies (Israel), BAE Systems (UK), Rapid7 (US), Dell (US), Verizon (US), CrowdStrike (US), Optiv (US), Trustwave (US), NTT Security (Germany), Resolve Systems (US), Kudelski Security (US), Swimlane (US), LogRhythm (US), Carbon Black (US), RiskIQ (US), Accenture (Ireland), AlienVault (US), Kaspersky Lab (Russia), Paladion Networks (US), and Coalfire (US). These vendors provide IR solutions and services to end-users for catering to their unique business requirements, productivity, compliances, and security needs. In April 2018, Symantec announced upgradation of its powerful threat detection technology used by its own world-class research teams available to Advanced Threat Protection (ATP) customers. Symantec’s Targeted Attack Analytics (TAA) enables ATP customers to leverage advanced machine learning to automate and discover the targeted attacks. In April 2018, McAfee partnered with Syncurity, a leader in the Security Orchestration Automation and Response (SOAR) space, to integrate its incident response Flow platform with McAfee’s enterprise security manager that enable customers to quickly identify and validate threats to their information from increasingly sophisticated cyber threats. In April 2018, Dell RSA acquired Fortscale, a pioneer in embedded behavioral analytics, to provide customers with new UEBA capabilities through the RSA NetWitness Platform. 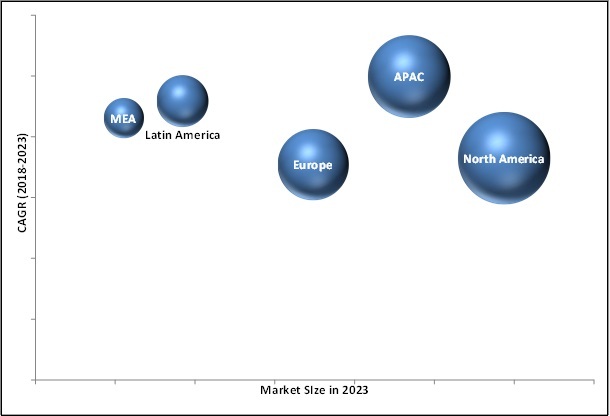 MarketsandMarkets forecasts the global Incident Response market size to grow from USD 13.38 billion in 2018 to USD 33.95 billion by 2023, at a Compound Annual Growth Rate (CAGR) of 20.5% during the forecast period. Stringent government regulations and compliances requirements, rise in the sophistication level of the cyber-attacks, and heavy financial losses post incident occurrence has led enterprises to adopt IR solutions and services to detect and respond to advanced cyber threats and data breaches. Moreover, the Small and Medium-size enterprises (SMEs) are gaining a high traction in the market, as they are more targeted by cyber-attacks and data breaches. With the adoption of incident response solutions, organizations can effectively maintain and secure their critical information from data breaches enable organizations to respond to an incident more efficiently. IR solutions help organizations optimize employees’ productivity, protect sensitive data, applications, and comply with stringent regulations. Incident response refers to a predefined and an organized set of procedures and approaches that need to be followed in the event of cyber-attacks, which are sometimes known as cyber incidents, security incidents, and Information Technology (IT) incidents. Incident response solutions and services help organizations handle and manage not only the aftermath of the attacks but also define a clear set of protocols that need to be followed before and during security incidents. These security incidents are handled by the Computer Security Incident Response Team (CSIRT) of organizations, thereby helping reduce the total cost and time involved in recovering from security incidents. IR services include various service types, such as IR retainer, assessment and response, tabletop exercises, IR planning and development, and advanced threat hunting. The assessment and response services is expected to dominate the IR market and is estimated to have the largest market share in 2018. The IR retainer is expected to play a key role in changing the IR marketspace and to grow at the highest CAGR during the forecast period, as these services help organizations to maintain access to the critical capabilities needed to effectively respond to various security incidents. The Banking, Financial Services, and Insurance (BFSI) is the fastest growing vertical in the global IR market, as the vertical has to meet stringent legal and regulatory compliances associated with information security. SMEs continue to deploy IR solutions, as they are facing security concerns and cyber-attacks such as Denial of Services (DoS) attacks; virus, worm, and Trojan horse infections; illegal inside activities: cyberespionage: and compromise of sensitive information of an agency. North America is estimated to hold the largest market size in 2018. The increasing need for organizations to reduce the misuse of the internet and enhance their employees’ productivity, and addressing the incidents of attacks on enterprises’ IT infrastructures are expected to drive the IR market. Furthermore, rapid economic growth in the major countries, along with regulatory reforms and economic stability, is expected to drive the incident response market in Asia Pacific (APAC). In the Middle East and Africa (MEA) region, enterprises in a range of verticals, such as BFSI, government, and manufacturing, are expected to increase their investments in IR solutions and services. Security vendors are offering various services types in incidence response market to detect, prevent, and respond to cyber-threats via IR retainer, assessment and response, tabletop exercises, IR planning and development, and advanced threat hunting. As the frequency of security breaches has increased over the past 5 years, organizations have increased their IT security investments to protect against advanced threats. However, for many enterprises, including SMEs, these investment costs are a matter of concern. For a strong and advanced security, the cost of innovation is still high. Hence, many organizations view budgetary constraints as a barrier to the adoption of advanced IR solutions and services. The BFSI sector mainly deals with the national and international regulations, such as Basel-III, GLBA, PCI DSS, BFSI is an industry term for companies such as commercial banks, insurance institutes, and nonbanking financial organizations, which provide financial products and services. The BFSI industry is always on the lookout for incident response solutions and services that could protect the industry’s employees, customers, assets, offices, branches, and operations. Hence, this vertical holds a significant share of the total incident response market. The government vertical consists of 4 institutional units, namely, central government, state government, local government, and the social security funds. The government agencies across the globe handle the critical and sensitive information by serving citizens and collecting intelligence. Cyber-attacks and vulnerabilities have increased the security breaches in various government agencies. Attackers are targeting networks across this vertical to breach the sensitive information related to the administration, departmental activities, and prime security intelligence. Incident response solutions are capable of protecting networks from cyber threats. Incident response vendors offer various solutions and services to this vertical for protecting the valuable networking assets. The healthcare sector provides products and services to treat patients with preventive and comforting care. This sector is witnessing considerable changes with the deployment of the latest trends in technologies that have completely transformed its operations. The use of various mobile and web applications has improved the productivity of professionals and patients’ experience. Technological changes centralized the storage of data, such as patients’ medical history, payment information, and Social Security Number (SSN), which are the prime targets for cybercriminals. Incident response solutions help organizations monitor, report, and remote login, and assist in the overall management, which include secure remote access, backup and recovery, and secure wireless connection. What are the new opportunities which the incident response vendors are exploring? Who are the key players in the incidence response market and how intense is the competition? The increasing adoption of cloud-based solutions and services among enterprises would provide significant growth opportunities to IR solution and service vendors. There are several established players, such as Symantec (US), McAfee (US), Palo Alto Networks (US), FireEye (US), IBM (US), Cisco (US), Check Point Software Technologies (Israel), BAE Systems (UK), Rapid7 (US), Dell (US), Verizon (US), CrowdStrike (US), Optiv (US), Trustwave (US), NTT Security (Germany), Resolve Systems (US), Kudelski Security (US), Swimlane (US), LogRhythm (US), Carbon Black (US), RiskIQ (US), Accenture (Ireland), AlienVault (US), Kaspersky Lab (Russia), Paladion Networks (US), and Coalfire (US).